Origin and Habitat: Querétaro, San Luis Potosí, Zacatecas. Description: Stenocactus phyllacanthus var. 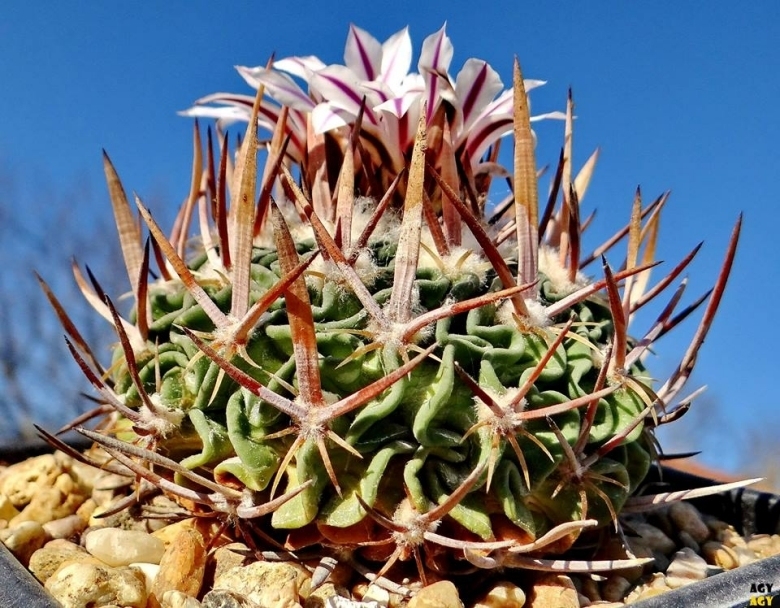 violaciflorus (Echinofossulocactus phyllacanthus v. violaciflorus) is a controversial variety now referred to Stenocactus phyllacanthus, but also referred to Stenocactus crispatus and Stenocactus pentacanthus. There is a general lack of understanding on the taxonomic position of the species within the genus and thus is it no possible to define either the spatial or systematic limits of the taxon. The var. violaciflorus mainly distinguishes for the flowers that are slightly larger, more numerous with creamy white petals with pink violet midstripe (not yellow). Whatever they are called they are all lovely plants meriting a place in any succulent collection.